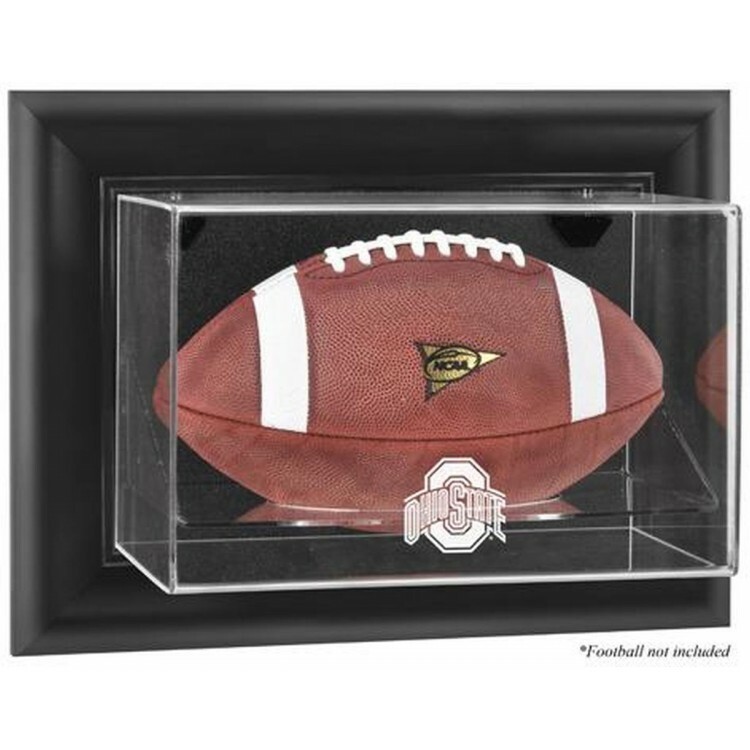 The Ohio State Buckeyes wall-mountable logo football display case is made of 1/8"-thick acrylic with a black wood frame. It features a clear acrylic removable lid with engraved team logo. It also comes with a mirrored back. The case is perfect for a collectible football. It is officially licensed by the CLC and the Ohio State University. Inner dimensions: 11 3/4" x 7 3/4" x 8". Outer dimensions: 16 3/4" x 12 3/4" x 8 3/4". Memorabilia sold separately. In Super Bowl XXVI on January 26, 1992, the Washington Redskins defeated the Buffalo Bills 37-24, be.. The Dallas Mavericks logo cap display case is made of 1/8'' thick acrylic. It features a black acryl..
Cell-fanStands make the perfect gift! Each cell-fanStand is made out of the highest quality 3/16" cl..
Get your football off of your dusty shelf and into one of our best football display cases. We have c.. The Los Angeles Clippers shoe logo display case is made of 1/8'' thick clear acrylic. It features a .. Display your favorite players shoe. Shoe case for up to size 13 has a black acrylic base and gold ri..
NEW! Our boardroom collection features a exclusive, custom designed base moulding profile for the se.. The Chicago Cubs logo batting helmet and baseball display case comes with a black acrylic base that ..
Officially licensed by MLB, Mega Tickets are sports history turned into unique wall art. They are cr..
What better way to properly light your game room or fan cave while showing off your team spirit then.. The Baltimore Orioles brown framed logo jersey display case opens on hinges and is easily wall-mount..
Machine-Made Tufted. 100% Premium Nylon Pile. Made in the USA! Wyoming 3'10"x5'4" College Team Spiri.. The Carolina Panthers wall-mountable football logo display case is made of 1/8'' thick acrylic with .. The Michigan State Spartans wall-mountable basketball display case is made of 1/8"-thick acrylic wit..